We started our educational visits with a lecture-discussion at the University of São Paulo. Professor Antonio Figueiredo of the Escola Politécnica gave us a wonderful introduction to the school of civil engineering, São Paulo, and the Brazilian nation as a whole. The University of São Paulo was founded in 1934 and enrolls 92,000 students. Higher education is free at state schools in Brazil but is very competitive, requiring specialized exams to be admitted. The University of São Paulo is the largest in Brazil and offers nearly 250 majors. Professor Antonio spoke not only of his work at the university but also of the greater civil engineering and development challenges that Brazil faces as it continues to grow. Brazil has a gross national production of about 14% of that of the United States, but this is continuing to grow. As urban centers such as São Paulo grow at a rapid rate the infrastructure needed to efficiently support the growth has struggled to keep pace. Traffic in the city is bad, and continues to get worse. The streets of São Paulo see 800 new cars each day, creating a multitude of related challenges. Vital truck transportation and emergency services have difficulty navigating through the traffic with detrimental effects to the economy and public welfare. Air transportation needs to be expanded to support not only the upcoming World Cup and Olympics, but also growing international commerce. Outside of infrastructure, there are challenges that stand in the way of continued growth and development of Brazil’s urban centers. Restrictions on the supply of fossil fuels and over reliance on rainfall for electricity mean that the reliability of energy for industry is not ideal. The supply of skilled labor has not been able to keep pace with development either. This is well demonstrated in the shortage of engineers. 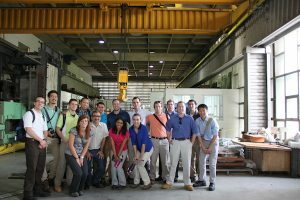 Brazil produces far fewer engineers than most other nations and is seeing their need for engineers grow every year. Professor Antonio did speak of future developments that should aid in the development of the nation. New metro lines are planned for both Rio and Sao Paulo, as well as a number of smaller cities. There are growing investments in public projects and infrastructure to support the World Cup and Olympics that will serve the nation after the games are over. Finally, Brazil has experience growing concern for environmental issues, a crucial consideration as the country grows and the supply of natural resources shrinks. Following our discussion with Professor Antonio we got to meet with Poli Junior, part of the Junior Enterprise Movement in Brazil. The Junior Enterprise Movement originated in France, and is very popular in European countries. This gives students the opportunity to help companies with their businesses and provides a wonderful experience for the students. 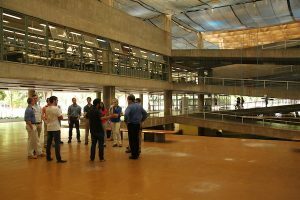 The program is especially strong at the University of Sao Paulo where they take part in 2,000 projects a year. The projects cover a variety of topics including civil, information systems, and mechanical prototyping projects. The students become involved in their first year of study and commit as many as 10 hours each day to support the projects in addition to their University studies. 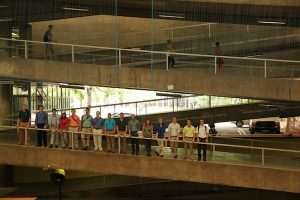 The visit to the University of Sao Paulo was overall a wonderful introduction to civil engineering and construction in Brazil and a great way to start our trip.